Jeff Carter snapped a tie in the second period and the Philadelphia Flyers beat the New York Islanders for the 13th straight time, 2-1 on Sunday night. The Flyers, who have won three in a row overall for the first time in two months, haven’t lost to the Islanders since Feb. 12, 2008. It is the longest active streak in the NHL, one win more than Washington’s current 12-game run over Tampa Bay. Danny Briere scored in the first period to give the Flyers their first lead and he nearly added another goal in the third, but that one was waved off. Video replay determined that Briere steered his own shot in with a skate after the puck hit goalie Martin Biron at the end of a 2-on-1 rush. 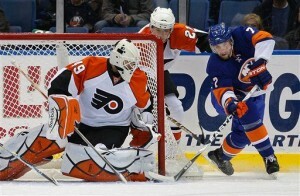 One key to Philadelphia’s win was the excellent goaltending by Michael Leighton. Leighton, who had been positively dreadful in goal till a week ago, has played very good his last two games. As have the Flyers whose win and loss totals for the 2009-10 NHL are now identical. Players and teams can have momentum swings in the NHL. Fans and bloggers shouldn’t become either too excited or depressed by the results of just a few games though it is hard to not be cheerful after seeing your favorite team win a few games. I can hardly wait for the Florida Panthers to win 12….cough 6…. cough 4 games in a row against any team. Or 4 games in a row period.